Now UC San Francisco scientists have shown that in the human hippocampus—a region essential for learning and memory and one of the key places where researchers have been seeking evidence that new neurons continue to be born throughout the lifespan—neurogenesis declines throughout childhood and is undetectable in adults. Alvarez-Buylla—a member of the Eli and Edythe Broad Center of Regeneration Medicine and Stem Cell Research at UCSF, the UCSF Weill Institute for Neuroscience, and the UCSF Helen Diller Family Comprehensive Cancer Center—is a leading expert in brain development who over the past 30 years has played a key role in convincing the scientific establishment that new neurons are born throughout life in animals such as songbirds and rodents. In recent years, however, the Alvarez-Buylla lab and others had already cast doubt on whether neurogenesis persists into adulthood in the human olfactory bulb, as it does in rodents, and have shown that while new neurons integrate into the human frontal lobe after birth, this process also ends during early infancy. 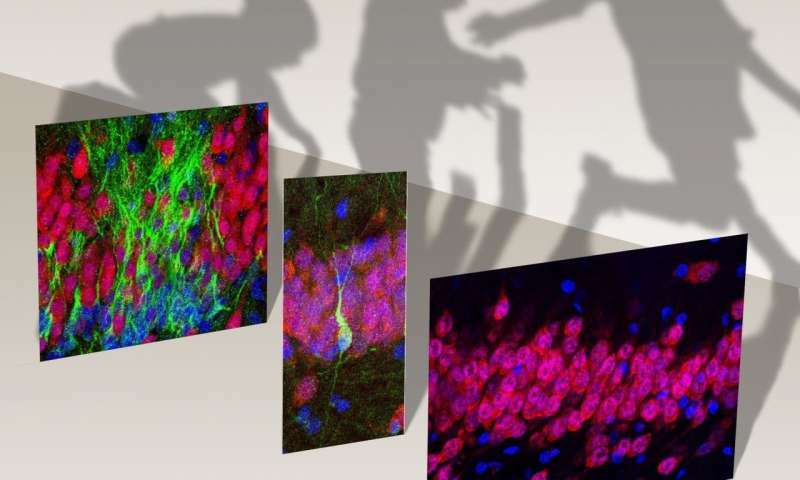 Rodent studies have shown that DG neurogenesis declines with age, but is otherwise quite malleable—increasing with exercise, but decreasing with stress, for example—leading to popular claims that we can boost brain regeneration by living a healthy lifestyle. Animal experiments have also suggested that neurogenesis-boosting therapies could treat brain disorders of aging such as Alzheimer's disease, and leading researchers have proposed that antidepressant medications like fluoxetine (Prozac) may work by increasing DG neurogenesis. Sorrells and Paredes analyzed changes in the number of newborn neurons and neural stem cells present in these samples, from before birth to adulthood, using a variety of antibodies to identify cells of different types and states of maturity, including neural stem cells and progenitors, newborn and mature neurons, and non-neuronal glial cells. The researchers also examined the cells they labeled based on their shape and structure—including imaging with high-resolution electron microscopy for a subset of tissue samples—in order to confirm their identity as neurons, neuronal stem cells, or glial cells. Does this mean I should throw away my Prevagen?